On our second full day in Taiwan, the day least likely to rain, after a well researched trip to a coffee shop turned out to be a complete failure and an impulsive trip to a hole in the wall with breakfast dumplings turned out to be a blessing, we hopped on a bus and headed West out of Taipei. Taipei's January weather of mid 60s and drizzly to full on pouring might strike some as dreary but for us it was a welcome respite from Seoul's below freezing winter and for me it had the comforting fog blanketed coastal feel of my childhood winters in Northern California. I woke up excited to be headed even closer to the ocean. We had a quick moment of panic when we though the bus was fuller than it was but quickly found empty seat towards the back and settled in for the rider. Dan with his video games and me alternately going through photos of the trip so far and just watching out the window as we left Taipei for smaller towns and the spaces in between. It's too chilly for the bus to have the windows open, so I see the ocean before I feel it, my giddiness rising. It's too foggy to get good pictures through the bus window, so I just wait and watch. We arrive in Jiufen, our destination and almost everybody remaining on the bus piles out with us and immediately stops to take a picture over the ocean. I wrap my scarf tighter around me, relaxing into the brisk salt air. "Home" I think to myself, happiest by the ocean. "Are you hungry? Let's go this way into the market." 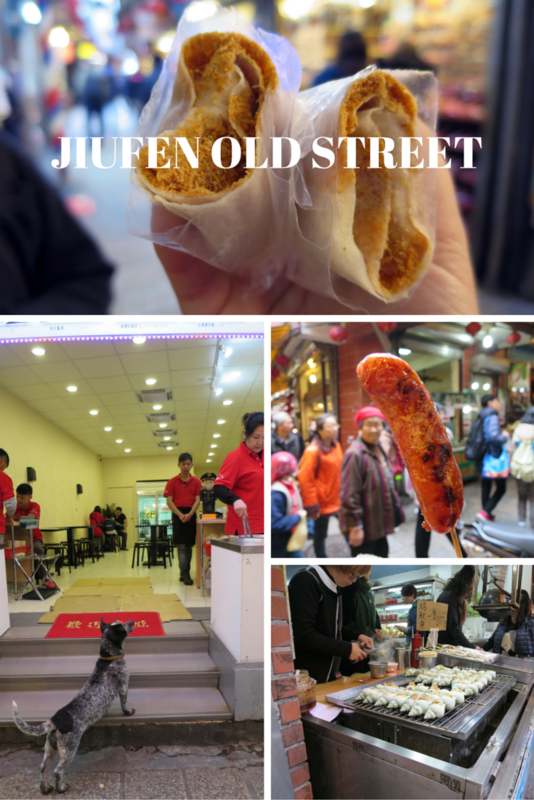 I pull Dan towards Jiufen's old street. After an initial bottleneck at the beginning, we find it's not so bad as we expected. It's a little before noon, so maybe we managed to beat the lunch rush. Severely under-caffeinated from our morning's watery siphon coffee, Dan was happy to see a row of dutch coffee drippers almost immediately on entering whereas I was taking note of the location of the peanut brittle ice cream wraps I had read about. The coffee was not good, but it was strong and we immediately regretted our decision to forgo milk and sugar. We head further into the market, occasionally hitting patches crowded enough that there's some light pushing. "Ooooh, pork and mushroom pastry, let's come back for that!" "Try this mochi sample! This is the most tender, most delicious mochi I've ever had"
"This is the best mochi! Do you want to get some?" "Not yet, later. Look another ice cream pancake place!" My first purchase is a thin slightly salty pancake (popiah skin), sprinkled with shaved peanut brittle, given two scoops of taro ice cream wrapped tight and then wrapped again in plastic. The man gestures to the various piles of money. Leave your coins and take your own change. He cuts the wrap in half and shoos me off, ready for the next customer. I love the combination of flavors and textures, Dan tries a bite, makes a face and hands it back to me. We walk on, occasionally being assaulted by the smell of stinky tofu and gawking at shells or giant mushrooms on grills. All the while, relatively clean, healthy looking market dogs are twining their way through the crowd, clearly on missions to their favorite booths. Dan's first purchase is crispy of fried mushrooms. "Spicy?" the woman asks us and we nod our heads vigorously as she adds an additional layer of seasoning. They're hot and juicy inside and I can't identify all the spices in the seasoning but it's delicious. "It's kind of like our hot pot spice mix and shichimi togarashi had a baby"
Sansho or sichuan peppercorns, a hotter chili pepper, something citrus-y (yuzu?) and more spices blend together. We keep going, stinky tofu smell getting stronger and mingling with the other popular item here, fish ball soup. Neither are particularly appealing to us, so we keep pushing through determined to get all the way to the end before making more purchases, making sure we pace ourselves to eat everything we want to and for things like sausages, make sure we go to the stall that looks like it has the best and hottest. We pass by soup dumplings, bubble tea and some sort of buffet situation we don't quite understand and out to the other end of the street, once again facing the ocean. "Do you want to get a bunch of things to eat now? Or get some things we can put in the backpack for our hike?" "Let's do both. Sausages first and then we'll go back and get some of those pork and mushroom pastries for the hike? Ok?" "Ok. Do I need to get the pork and fish egg sausage? Is that too weird? Is it being too weird exactly why I need it?" The sausage is hot and crisp on the outside and my teeth snap through the casing to a tender and slightly sweet center. I often complain about the sweetness of sausages in Korea but this is different, more balanced. The combination of the slightly sweet pork with the salty cooked roe is a bit odd at first but it grows on me. Dan has the regular pork sausage which is the same but a bit bigger and minus the roe.